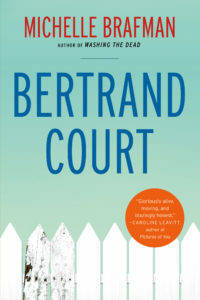 I am very excited to announce the next book for the EDIWTB book club: Bertrand Court by Michelle Brafman. Brafman follows her rich and insightful first novel about family and tradition, Washing the Dead, with this compelling profile of a suburban Washington D.C. neighborhood. Moving chronologically from 1993 to 2007, the novel follows the diverse residents of the eponymous cul-de-sac, tracking their daily routines, their secrets, and their sorrows in seventeen exquisitely crafted, interlocking narratives. Brafman, an award-winning filmmaker as well as a widely published writer honored with a Special Mention in the Pushcart Prize Anthology, employs humor, deft pacing, and artful jump-cuts to vividly and warmly evoke the lives and families of policy wonks, politicos, and housewives. So it’s 1) domestic fiction 2) made up of interlinked stories 2) that take place in DC 4) over 14 years. What could be better? The first 20 people to sign up will receive copies of the book, which comes out this month. We’ll discuss it here on the blog in a few weeks. Posted on September 1, 2016 by gayle. This entry was posted in Online Book Club and tagged bertrand court, book club, michelle brafman, online book club. Bookmark the permalink. This sounds so different than anything I’ve read. I’m excited to read it.